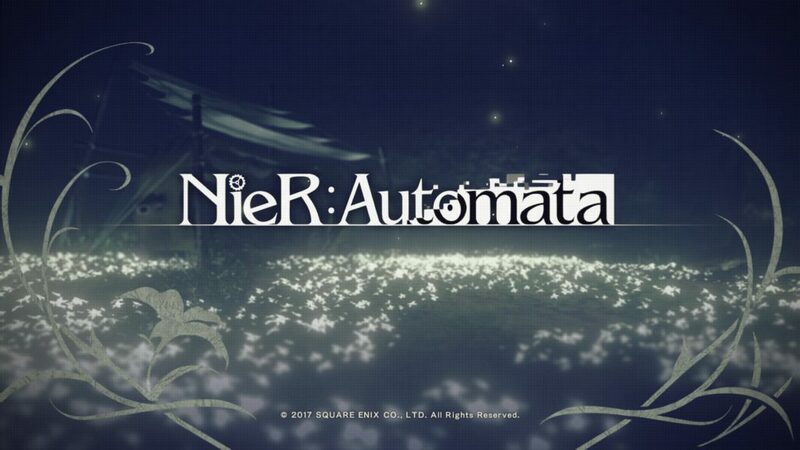 NieR: Automata Game of the YoRHa Edition is an Action RPG, developed by PlatinumGames and published by Square Enix. This Edition is available on PlayStation 4 and Steam. The Game of the YoRHa Edition is not available for Xbox One users, but those players have acces to NieR: Automata – Become as Gods Edition, which includes similar DLC. 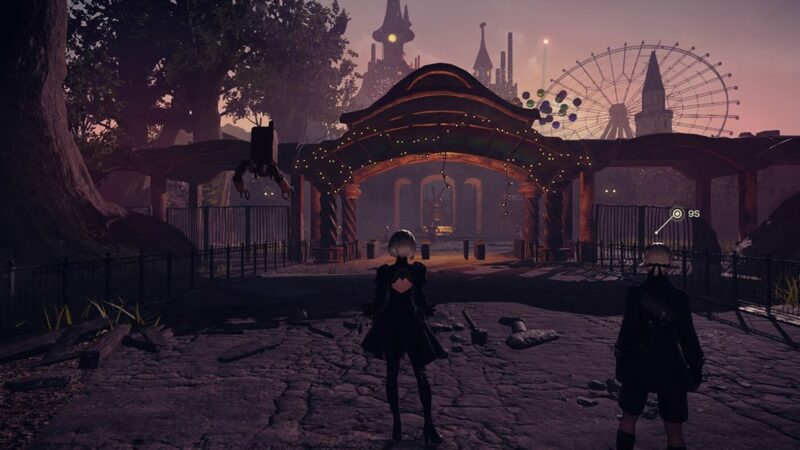 Nier: Automata is a sequel to the 2010 game NieR, set on a post-apocalyptic Earth in the midst of a proxy war between machines.Glory to mankind! Mankind’s glorious history came to an abrupt end, when the world was invaded by aliens. The aliens unleashed a new breed of weapon, being machine lifeforms, that all but annihilated civilization. The handful of survivors that remained, fled from Earth, seeking refuge on the moon. Humanity launched its counterattack, deploying an army of androids from the Bunker, an orbiting base, but the androids still haven’t managed to repel the invaders. 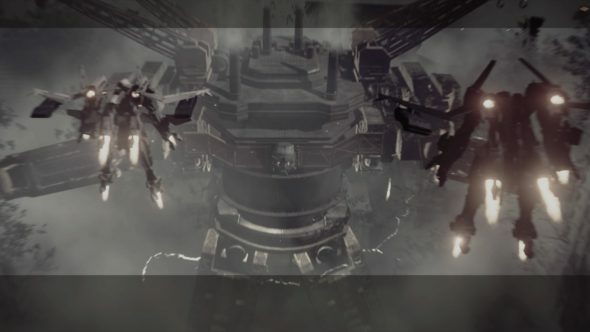 This is why the YoRHa, an elite force of androids, exist, to break this stalemate once and for all. 2B is a battle android, and a member of the YoHRa. She is calm and composed. 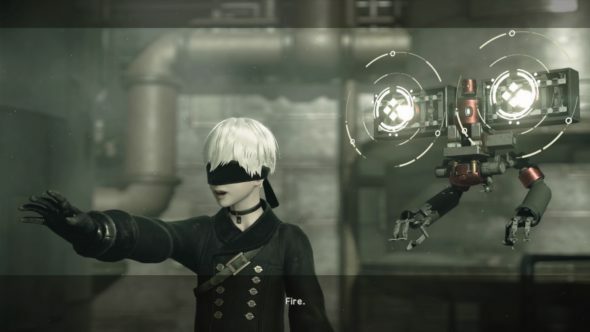 Her partner, 9S, is a scanner unit. He is basically a recon of sorts, who excels at hacking machinery. He is much more emotional and curious than 2B, which offers an interesting dynamic between the two. Together, they are on a mission to clear out machine threats for the local resistance, a group of old YoHRa units, based on earth. While doing missions for Anemone, the leader of the resistance, they discover strange behavior in the machines. With a few unlikely allies, they uncover alarming secrets that may shake the very foundation of everything they believe in. 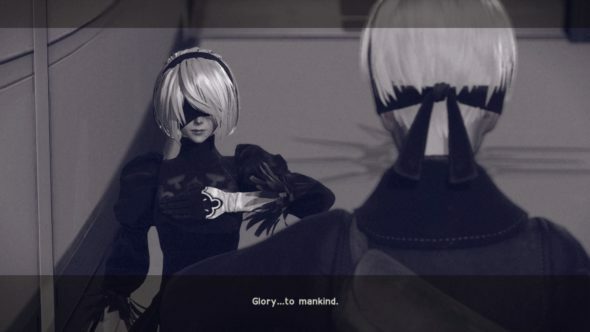 Although the narrative within NieR: Automata can sometimes be overly complex, it tells an epic tale about the philosophy and the nature of humanity, morality, and free will. The game is filled with many mind-blowing twists, and asks some mind-boggling existential questions. NieR Automata offers a revolutionary way of story-telling, with three different play-throughs, with each one offering a different perspectives and unique gameplay mechanics, all adding to the bigger picture and ultimately, giving you its true ending. The visuals in NieR: Automata are stunningly artful and flavorful. When running around in the Bunker, the panoramic black and white visuals are amazing, and it almost feels like a space film-noir. On the Earth’s surface, the environments are purposefully grizzled and bleak, with sandy yellow textures and lush green nature to contrast it. The game wants you to experience an Earth where humanity has been absent for many years, run down by machines, that have now inherited this bleak empty shell of a place that was once mankind’s legacy. The city’s ruins have an appropriate desolated feeling to them, where nature has flourished with large branches towering above you, connecting worn down skyscrapers. The city’s surrounding environments are uniquely different, yet offer the same dreadful bleakness. From a lush forest, a vast empty desert plane, a large castle, to a machine-filled amusement park. The lighting is amazing as well. With the function to activate a flashlight on your pod in dark areas, casting shadows that perfectly mimic your every move. Unfortunately, the graphics, although being extremely flavorful and thematic to the overall experience of the game, can be considered a bit outdated or undetailed at times. You may experience some pop-in issues, and the fixed camera can sometimes feel very clunky, and unresponsive to the fast-paced action on screen. Probably the most impressive feat in NieR: Automata has to be its award-winning music, composed by Keiichi Okabe. The game offers six hours of original music, across over one hundred different tracks, including electronic, ambient, melancholic and orchestral music, often with amazing vocals. During hacking gameplay, the music changes to an 8-bit track, which is very flavorful and blends perfectly with its retro-like gameplay. The voice-acting is great, and you have the option to choose between English or Japanese respectively. The lip-syncing, however, isn’t that good and can be slightly distracting during cutscenes. 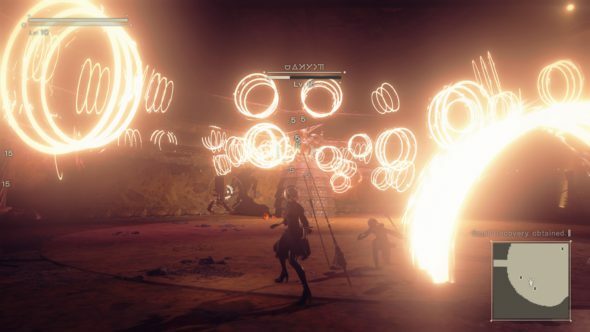 Nier: Automata is an open-world Action RPG, but offers much more than just that. The game not only has very satisfying fast-paced hack-and-slash gameplay, with RPG elements, but also includes a unique hacking mechanic, platform and arcade-like gameplay, and fun Gundam Wing-type battles. 2B plays out very aggressively and excels at close-combat. She handles two swords, and switches them around while utilizing fast and strong attacks to perform devastating combos. The dodging mechanic is satisfying and very responsive, making for smooth and enjoyable combat. For long range attacks, you can fire a Gatlinggun or a missile launcher using your accompanied Pod. You can also equip your Pod with a special attack, and there are many different ones acquirable, such as a shield, a laser beam, a volley of bombs, and much more. 9S doesn’t like close combat, so he excels at long-range support and hacking enemies, which can damage them, inciting them to attack their allies, or he can even gain control of them remotely. Although the game’s hacking mechanic is a recurring and important element of combat at certain points in the game, it feels like a fun little retro mini-game. There is an option to change the combat style of your partner, but this often feels very redundant. There are different types of weapons you can acquire, such as small and large swords, spears and combat bracers, and each of them can be upgraded. Just like your computer, androids have a hard drive, and each hard drive has a limited space on it to house its programs. 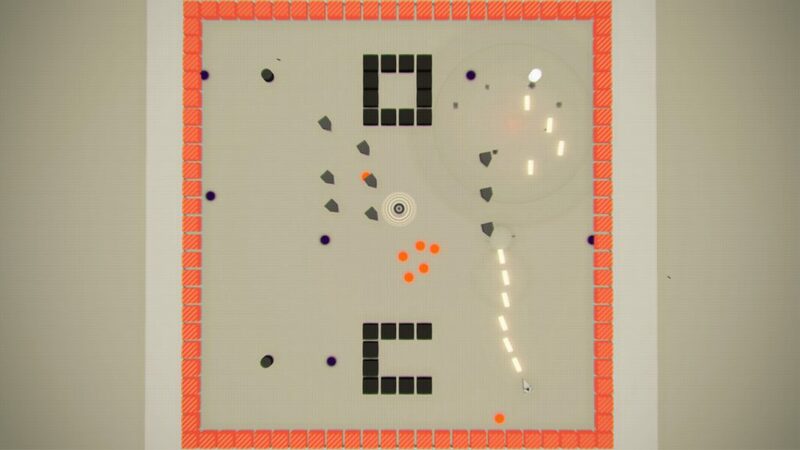 You will acquire different plug-in chips that offer unique attributes that can be split up into different types, such as attack, defense and support. These plug-in chips can increase your attack or HP, but also make you move faster, heal yourself and much more. You will always have to strategically decide which plug-in chip to equip to your character, and it is wise to upgrade your storage as soon as possible. If you have two of the same plug-in chips, they can be fused together into a bigger one, making the attributes even stronger. Although many of the machines initially look alike, there is a great variety in enemies with each its own unique design and fighting style. One of the best aspects of the gameplay, has to be the unique boss-battles. Each one is challenging and has to be defeated in multiple stages, making them all feel like epic battles, where you jump up in excitement when finally delivering the finishing blow. NieR does not have an auto-save function and relies on manually saving at an Acces Point . When your character dies, its body remains on the map as a corpse. These bodies contain various data, such as the experience points gained since your last manual save, as well as changes done in your equipment settings. You will have to find your corpse to retrieve its data. If you die again, before reaching your previous body, or if you keep playing for an extended period without retrieving your body, it will disappear. 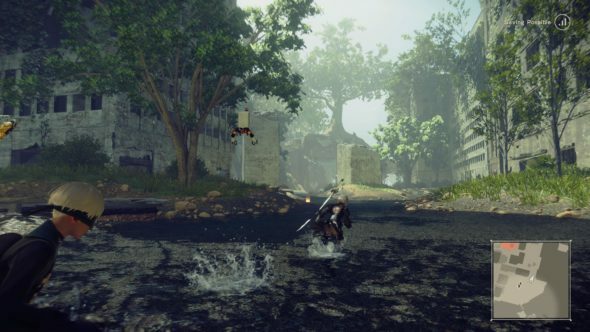 NieR Automata is large open world game. Luckily, after using a dash forward, androids can run really fast. For those who prefer riding an animal, you can choose to traverse the wasteland on an elk or a boar, when they’re fed some bait. After a couple hours of gameplay, an Access Point can transport you to all the places you’ve previously visited. If you choose to just follow the main storyline, the game will take you about twenty-five hours to complete, although it is strongly recommended to do the side-quests. Like in most RPG games, these quests can be somewhat tedious fetch-quests or someone needs some enemies defeated in a certain area, but NieR: Automata offers a whole lot more than just those typical side-quests. There are many fun, but also sometimes depressing story-driven quests all around, giving you more insight in an Earth devoid of the human race, where robots rule the world. The game’s difficulty can be changed in-game, so you can easily tune it, to make it as challenging as you want it to be. NieR: Automata’s DLC brings costumes, inspired by the original NieR, new music, equipment, and other cosmetic items, as well as challenging coliseum battles. These coliseum battles house some of the most challenging fights in the game and can result in some unique rewards and outcomes. Nier: Automata revolutionizes story-telling and tells an epic story that’s much deeper than it initially leads on. The graphics are perfectly flavorful and thematic, but can feel a bit outdated at times, from a technical standpoint. 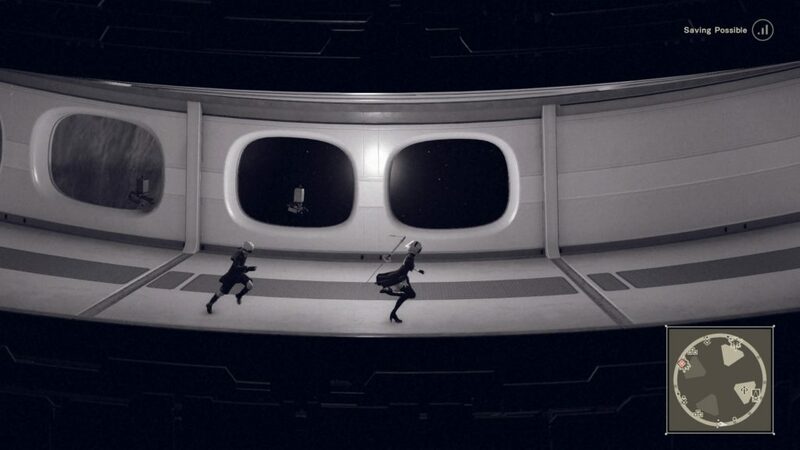 The music inthis game is an experience in itself, and has rightfully won awards. It might go down to be one of the greatest scores in gaming history, or at least just as an amazing piece as art. NieR’s gameplay is very refreshing and combines multiple types of gameplay into one satisfying whole. The combat is fast-paced and addictive and the boss-battles are epic. Although NieR: Automata speaks to a certain type of gamer, being a Japanese RPG, it should be experienced by every mature gamer out there, for it is already considered a masterpiece in gaming. This game, even if some elements don’t speak to you initially, is a definite must-play. JasuSakura, you’re absolutely right! I should’ve mentioned that this game is must-play for players who haven’t bought the base game yet. The DLC does not warrant buying the Game of the YoHRa Edition for those who have the base game. I totally agree with you, I also don’t like it when you buy a collector’s edition, or a game of the year edition, that the DLC is not included on the disk.